Making the most of your land. Research has shown the effectiveness value of planting higher seeding rates in more productive areas and decreasing rates where productivity is lower. Over the past few years, more growers have become interested in using variable rate seeding (VRS) technology to optimize return on their annual seed investement. Those using this technology expect it to increase yield and reduce seed cost. Many new planters today come with variable-rate capability, making it relatively easy to empoy a VRS strategy. Even with that, growers still need a reliable method to determine variable seeding rates and to evaluate whether their strategy ultimately worked. It starts with soil sampling followed by yield monitor mapping. We'll show you the agronomic basis for changing seeding rates across variable fields, guidelines for developing a strategy, and methods to determine if your strategy improved yield and profitability. After we develop and implement the planting prescription strategy, we need to evaluate the results. There are two common methods of evaluating the effectiveness of VRS prescriptions -- planting "check" blocks or strips at rates higher and lower than those prescribed for the managment zone. By comparing performace of the prescribed rates vs. these "check" rates, the effectiveness of the prescription can be determined. 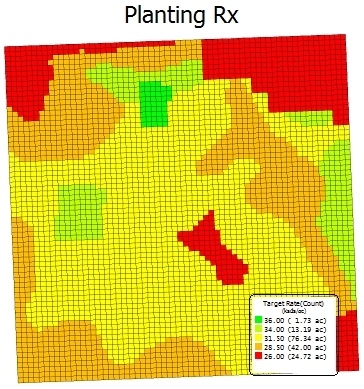 For check blocks we place blocks of higher and lower planting rates inside at least one management zone of each prescription rate. We make sure the check block is well within the zone rather than on the edge, and that it does not comprise most of the area of the zone. Each check block typically encompasses about one to two acres in area and is relatively square. Check strips are typically field-length strips of a single planting rate that pass through several management zones. A strip should be placed so that it crosses management zones of most or all other rates. There should be at least one strip for each designated seeding rate. Typically the strips are one planter pass wide. After stand establishment, we take stand counts in the different planting rate zones and the check areas (blocks or strips). It is important to verify that we actually achieved target populations to make sure our test is valid. We also pay special attention to high stress areas such as poorly drained spots or high crop residue areas. To interpret the results, we use yield monitor mapping or Geographic Information System (GIS) software to compare yield results. We compare yields within check blocks or strips to yields in adjacent areas. Then we ask a couple of questions. One, did higher seeding rates produce greater yields in the low productivity zones? Two, did lower seeding rates produce equal yields in the high productivity zones? If yes, then we adjust the prescription planting rates accordingly next time that crop is planted in the field. We then evaluate profitability by comparing yields and accounting for seed costs for any two rates in question. If there are additional costs to implementing the VRS strategy, we include these costs in your equation. In order to make the most of the data, we recommend planting comparisons in different fields over several years to better understand the value of variable-rate or uniform-rate seeding strategies.